The Democrats organizing an effort to block Nancy Pelosi from retaking the House speaker's gavel have finally gone public. Eleven House Democrats and five incoming freshmen have signed a letter promising to vote against Pelosi in Democrats' internal caucus leadership vote as well as on the House floor in January. It's a smaller number of signatures than the letter's organizers had indicated. The letter was initially supposed to be released last week. "That number is growing, so we're just going to keep at it," Ohio Rep. Tim Ryan said Wednesday, when asked when the letter would be posted. "If the momentum keeps building like we see it is, then we may keep it open for a little while." No Democrat has stepped forward to directly challenge Pelosi for the speakership, so she remains the overwhelming favorite to win next week's internal vote. The question is whether the anti-Pelosi Democrats can deny her the 218 votes she would need on the House floor in January. "Our majority came on the backs of candidates who said that they would support new leadership because voters in hard-won districts, and across the country, want to see new change in Washington," the letter reads. "We promised to change the status quo, and we intend to deliver on that promise. Therefore, we are committed to voting for new leadership in both our Caucus meeting and on the House Floor." Asked last week about the possibility of a direct challenge from Fudge or any other Democrat, Pelosi seemed to welcome a head-to-head contest. "Come on in, the water is warm," she said. Pelosi's spokesman, Drew Hammill, said after the release of the letter on Monday: "Leader Pelosi remains confident in her support among Members and Members-elect." Nancy Pelosi has been a member of the U.S. Congress since 1987. In 2007, she was elected as the first woman to serve as speaker of the House of Representatives. And since then, she's been the leader of the Democratic Party in the House. Because of her high profile, Republicans have often used her as a foil in their campaign ads - like this recent one for Republican Steve Watkins, who was running against Democrat Paul Davis in Kansas in these past midterms. UNIDENTIFIED PERSON: A vote for Paul Davis is a vote for Nancy Pelosi. That's too risky. MARTIN: Davis lost that race, by the way. So now that Democrats have won control of the House, some of them are arguing - for a whole lot of reasons - that it's time for a change at the top. Yesterday, 16 Democrats released a letter saying they will vote for someone else to be speaker of the House. The problem is there really isn't a someone else to consider at this point. And Pelosi insists she's got the votes to win. NPR's congressional correspondent Scott Detrow joins us now in the studio. 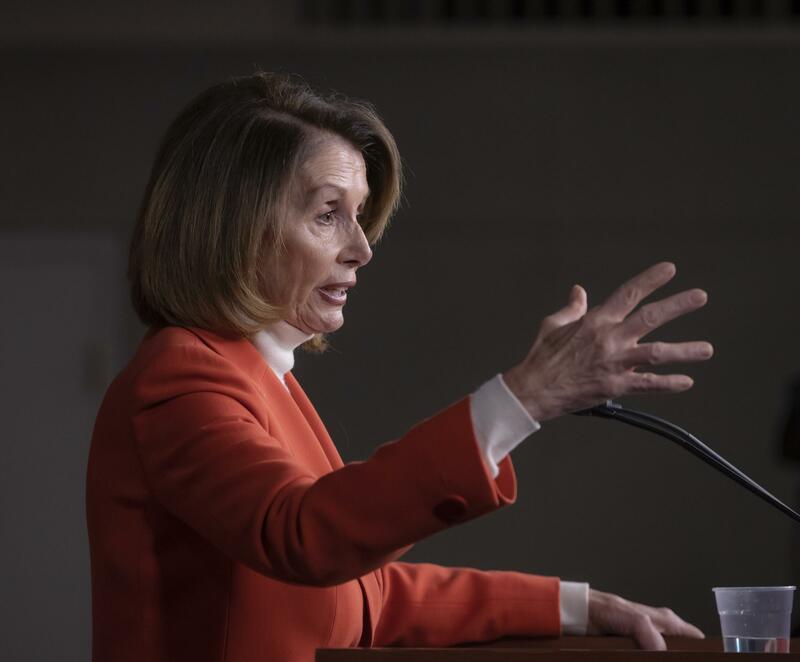 MARTIN: Nancy Pelosi has faced her fair share of challenges before. How does this one stack up? DETROW: This is pretty serious. The number of Democrats opposing her is right on the verge of the amount of Democrats it would take to block Nancy Pelosi from getting the votes she needs on the House floor in January. She's running currently uncontested in next week's caucus election. And the best thing she has going for is the fact that no Democrat has stepped forward to directly challenge her. But this opposition from Democrats is pretty serious, and Pelosi is taking it seriously. MARTIN: What's the argument? Why did these Democrats want her gone? DETROW: There are a couple of different arguments. The most powerful one is that - they argue that voters wanted a change. They say that this was a change election - that Nancy Pelosi and other top Democrats, like Steny Hoyer and James Clyburn, have just been in the same place for so long. I think it's more accurate to say that a lot of House Democrats are ready for a change. Because of that block at the top of leadership, they feel like there hasn't been much room for them to grow and advance. Marcia Fudge from Ohio is one of the Democrats opposing Pelosi. She's actually thinking about challenging Pelosi for speaker. Here's what she said about this. MARCIA FUDGE: We have a lot of very bright people in this caucus, and everybody knows it. But it's very difficult to move up in an environment where the same people run everything all the time. DETROW: In recent years, you've seen a lot of House Democrats run for other offices or simply end their careers in the House because they've been frustrated by this. MARTIN: So I hear you saying they want change for the sake of change. Is there something Pelosi has done or not done that they don't like though, substantively? DETROW: You know, one of the - I think the other angle is just the politics of it. They feel like Nancy Pelosi has become this criticism point that every single Democrat - you heard that ad - every single Democrat is basically painted as a proxy for Nancy Pelosi. And they're frustrated with that. Pelosi's allies argue that's just the territory of being a legislative leader. It's not a popular job. And they also say, hey, we won a ton of seats running against these ads. It clearly wasn't that effective. MARTIN: Right. So how is Pelosi herself responding to all this? DETROW: She is taking this increasingly seriously. You've seen her roll out a ton of endorsements from all sorts of different liberal groups in recent weeks. You've also seen her meet, person by person, with a lot of incoming members. And she's actually gotten a lot of commitments to vote for her from members who had previously said that they weren't going to say publicly whether they support her or not. Pelosi said the secret to her career - not really a secret - is that she's very good at counting votes. Here's how she put it to me in an interview this summer. NANCY PELOSI: I'm a numbers person when it comes to counting votes for legislation - passing the Affordable Care Act, the Recovery Act - the list goes on - Wall Street reform and the rest. And I'm a numbers person when it comes to my own possibilities in the Congress. DETROW: And you hear her pointing out all the things she's been able to accomplish there. She's been a very effective leader, especially compared to how John Boehner and Paul Ryan ran the house when they were speaker. MARTIN: So real quick, you mentioned Marcia Fudge as a possible contender. This election is happening real soon. So when do these people need to make up their mind? DETROW: In the next few days - the Democratic vote is the 28, a week from tomorrow. And that'll decide who the Democrats will support. But again, the biggest problem Pelosi has is that early January floor vote. MARTIN: NPR's congressional correspondent Scott.